This past week, I got a chance to interview writer/author Nicety Couture. The author resides in Chicago, IL. I met her via Facebook and we have developed a great social media friendship as writers. I wanted to share her story with you today. Mrs. Couture maintains has a huge fan base via Facebook and Twitter. Not only does she write daily, she publishes her own work, and is a mother and wife! Sit back and get ready for this awesome interview. 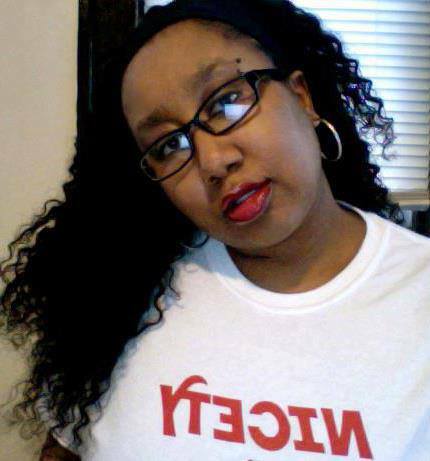 Nicety Couture keeps it real 365 | Daily! When did you know that you were a writer and wanted to become a full-time publisher? I’ve always loved writing, since the 3rd grade but I decided that writing would be my career in college. My professors told me I was good at it and I should try to publish. One day I was sitting at my computer on Facebook seeing all of my self published author friends saying that they were living their dreams. I too wanted to live my dreams but I was afraid to do it and didn’t know how to start. From my previous experience in the publishing world, I decided not to ask anyone for help and made Google my best friend. I must’ve Googled for weeks before actually putting my first book out. I’ve been living my dream ever since. What is the name of your publishing company? How did you go about starting your own company? My publishing company is called Black Cherry Publishing. I started the company by Googling everything I needed to start an LLC and small business. Like I said before, Google is my new best friend. What are your reasons for becoming an author? I love to write and wanted to share my love with the world but I also wanted to do this full-time and be able to make a living so that I can actually say I do what I love. What genre would you categorize your work in? What are you currently marketing to the public? Currently I am marketing my latest novel, Juicy 2, which is the sequel to my first Amazon #1 Bestseller and the book that put me on the map, Juicy: Pandora’s Box. Really, I can write anywhere. I don’t even need a laptop to write. I can use pen and paper but my favorite is my cell phone. Most of my stories are written on my Samsung Galaxy 3. What was your motive for writing your latest book? My motivation to write Juicy 2: Vengeance was the readers. The readers had been asking me for the longest when they could get an update on the Diamond, Lexi, and Pandora. So I gave it to them. Juicy 2: Vengeance can be downloaded on Nook and Kindle. Paperback will be available shortly. How many books do you now have in print? Currently I have 6 but more are on the way! What are some of your struggles that you’ve went through as a writer and publisher? I would say the main struggle would be reaching a broader audience. But that struggle will soon be conquered. More details about that to come. Do you find it hard being a Black writer (female) in America? I don’t find it hard to be a Black female writer in America but I do find it hard to be in the genre that I’m in. It seems that as a people we can’t find the common decency to support one another. I hope to be the face of change when it comes to that as well with my #SUPPORTBLACKAUTHORS movement. If you could sit down with any writer from the past who would that be? List five words that describe you as a writer.